Ever wanted to buy a dog interactive toy for your dog, but unsure which, out of all the many options out there, to get? Having faced the same problem, after much deliberation and consideration, here are my short listed top 5! All these were purchased from Amazon and received within two weeks via free shipping (Amazon provides free shipping to Singapore and Mexico with eligible purchases over USD125)! This puzzle works by sliding pieces. There are little indentations under the sliders, and dogs have to use their nose or paws to move the sliders around to get the treats. Although one of the simpler Nina Ottosson dog puzzles, it’s a good start if your dog, like mine, is new to interactive dog toys. There are 2 difficulty levels within this game. You could either completely cover the treats with the slider pieces, or leave the treats slightly exposed. This is good for dogs learning nose work, as they will be trained to use their nose to sniff out the treats and move the sliders! This puzzle toy works with the basis of “lock and key”. The little light blue bones on the top serve as a lock for the mini drawers below. The dog has to lift the bone keys out, before the drawers containing the treats can be opened. This puzzle is considered one of the more challenging puzzles by Nina Ottosson. You might have to split the learning process into 2 parts – Firstly to grab the little bone “locks” off the puzzle, and secondly to open the drawers. The Kong Wobbler works through, as the name suggest, wobbling. The base of the Wobbler is weighted, like a roly-poly, hence it springs back after getting knocked down by the dog’s paw or nose. 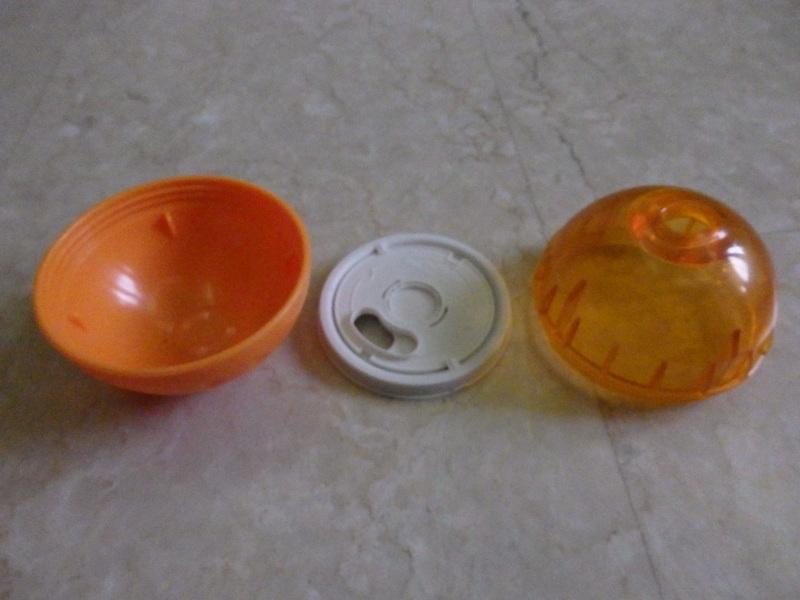 The Kong Wobbler opens in the middle where kibbles or treats can be added. Each knock allows the treats to fall out. The Kong Wobbler comes in 2 sizes – Large and Small. The large size can contain up to 1cup of kibbles, while the small can contain up to 1/2 cup. 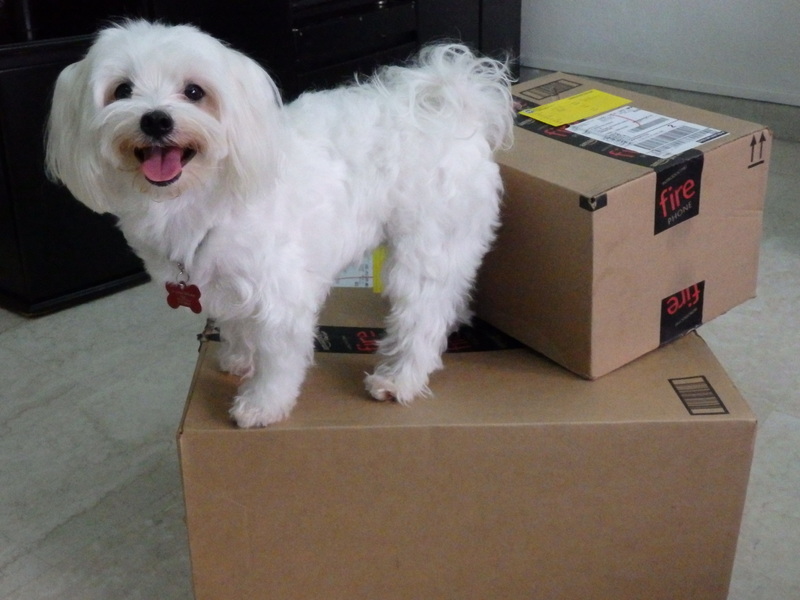 The large size is recommended for dogs over 25lbs, while the small is suitable for dogs smaller than 25lbs. Little to no noise made from the wobbler itself, good for dogs that are easily spooked. However, depending on the force exerted, may be noisy on hardwood floors. 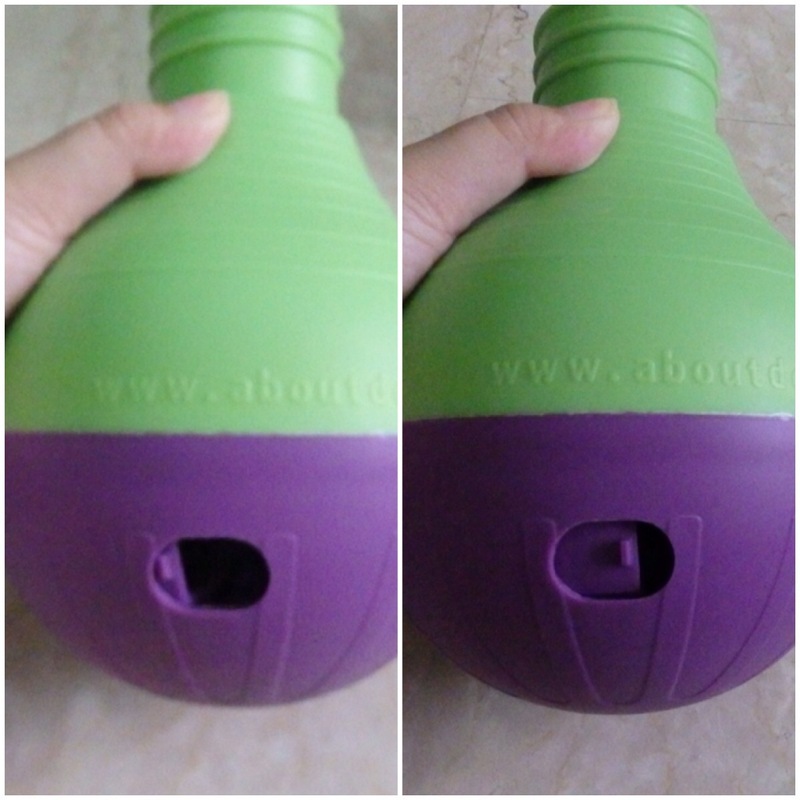 The Bob-A-Lot’s works with the same concept as the Kong Wobbler. However, what a sets the Bob-A-Lot apart is the ability to adjust difficulty level. The base of the Bob-A-Lot is completely rounded, hence the will be some movement especially on hardwood or marble floor. There is also slightly more noise as compared to the Wobbler due to it’s plastic material. 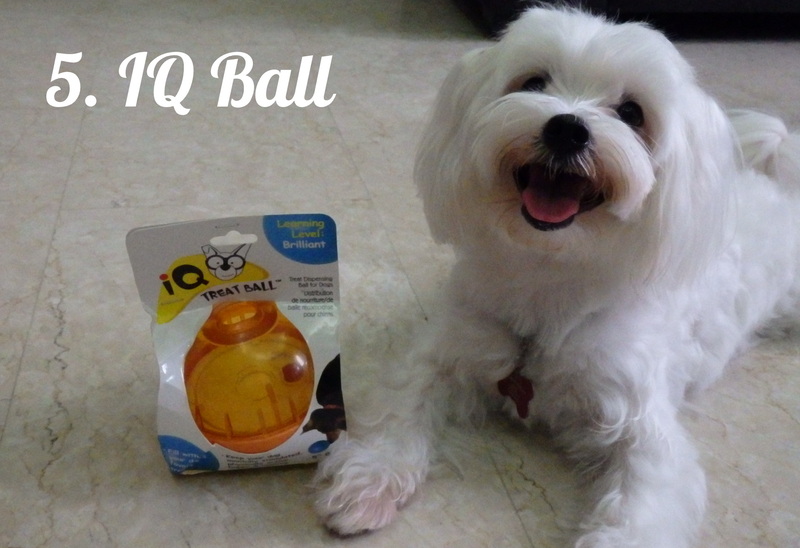 The IQ ball is another treats dispensing toy, but unlike the Wobbler and the Bob-A-Lot, since it’s round, it rolls about when the dog paws or noses it. Hence, it would be good to occupy the dog for a rainy day with no walks! 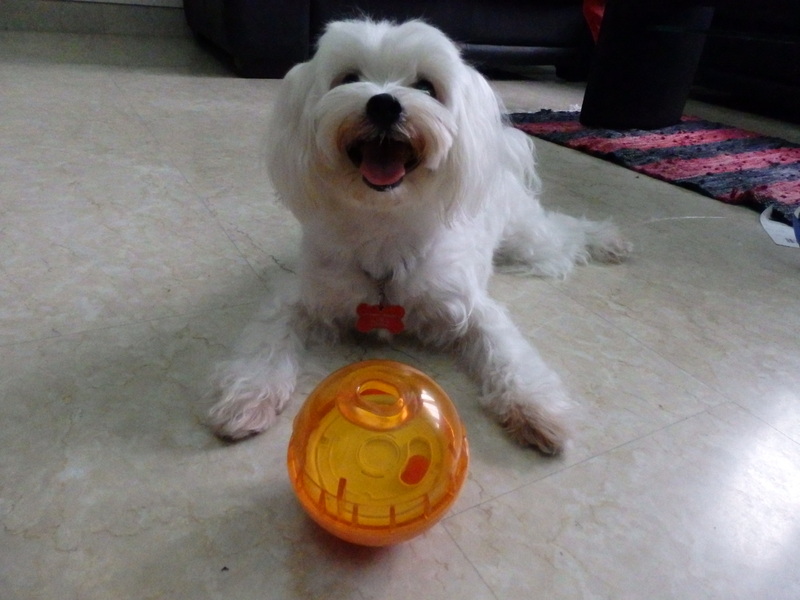 The difficulty level can also be adjusted as per your dog’s requirements, making play time longer for the smarter dogs. However, it is considerably noisier than the Wobbler and Bob-A-Lot. 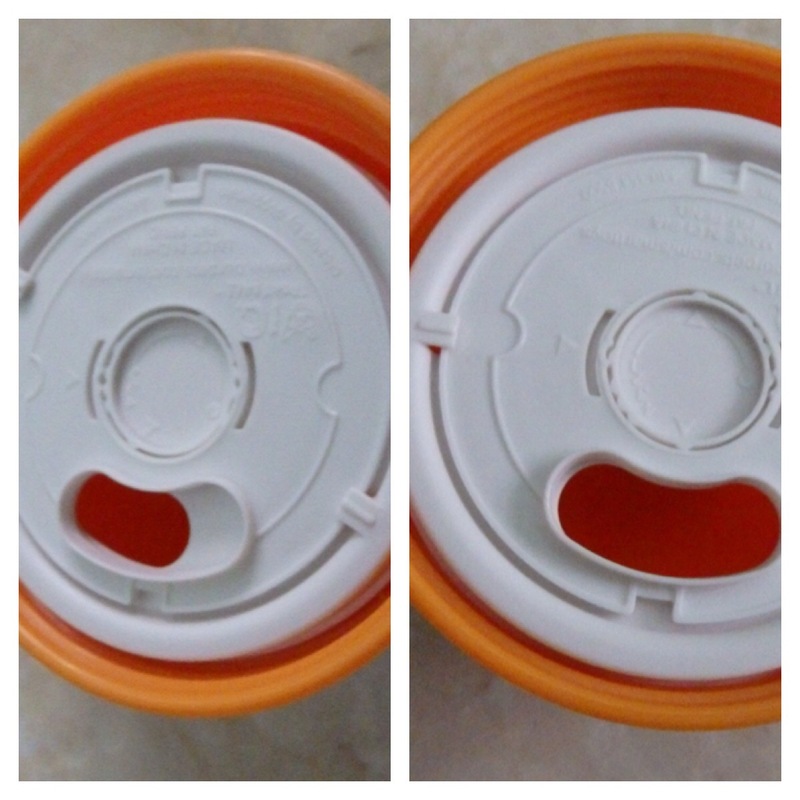 It comes in 3 different components, 2 covers and 1 one plastic plate. Treats are places at the bottom cover, then covered with the plastic plate followed by the cover with the exit hole for treats. The difficulty level can be adjusted through widening or closing the slider on the plastic plate. Cotton’s first try with the IQ ball. 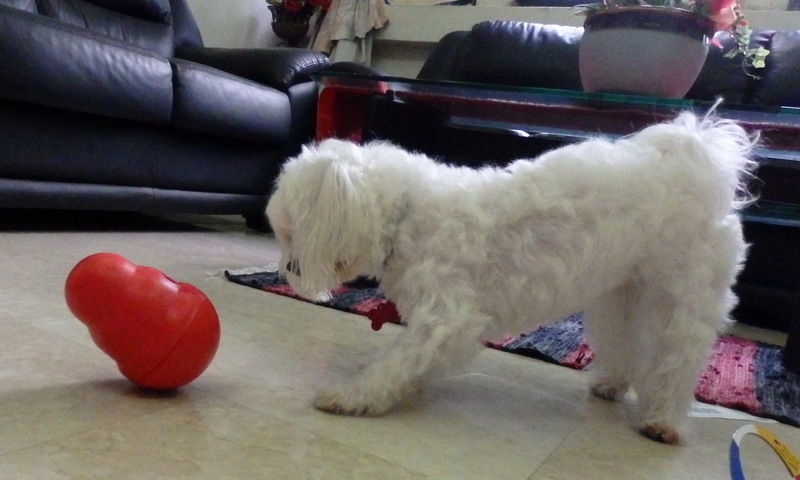 She came to check the Kong Wobbler after a few rolls of the IQ balls, which is probably because of the greater difficulty level. Personally, out of the 5, my favourite treats dispensing toy has got to be the Kong Wobbler. 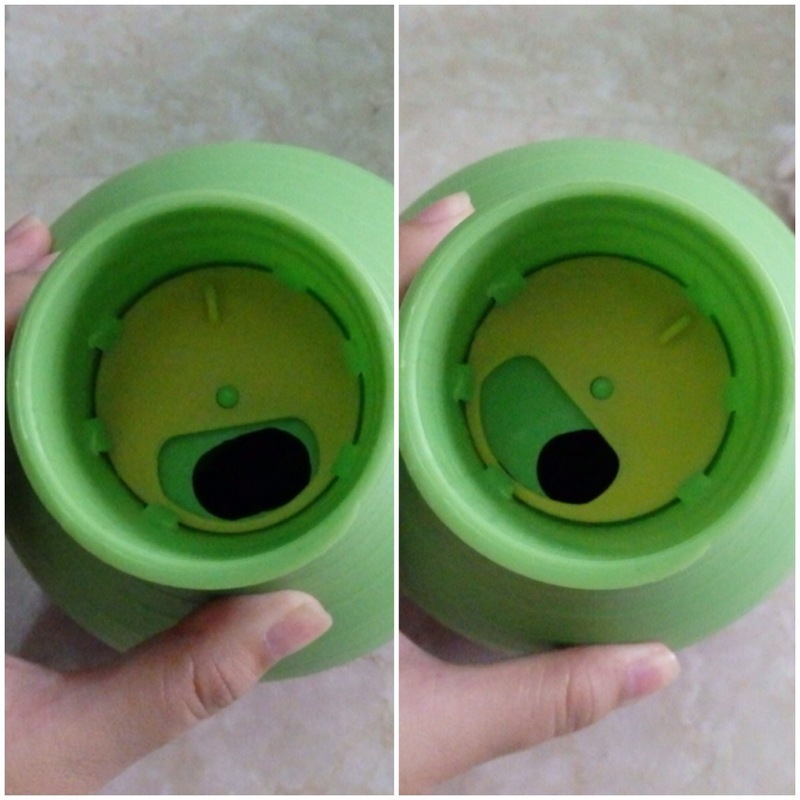 Its simplistic and classic Kong design makes it pleasing to the eye, and it’s opening at the middle makes for easy cleaning, a major plus for me. The heavy weighted base also prevents a 180 degree spring back, hence preventing the toy from whacking your dog in the face, unlike the Bob-A-Lot, which continues full-speed bobbing after a hit due to the round base. However, for a more intelligent, larger sized dog, the Bob-A-Lot should be preferable as this problem will be circumvented and the difficulty level can be adjusted. Comparing between the dog casino and the dog brick puzzle, I prefer the former due to it’s higher difficulty level. There are many ways to get about playing with it, I.e hiding the treats under the bones cup, rather than the relatively one-dimensional dog brick puzzle. 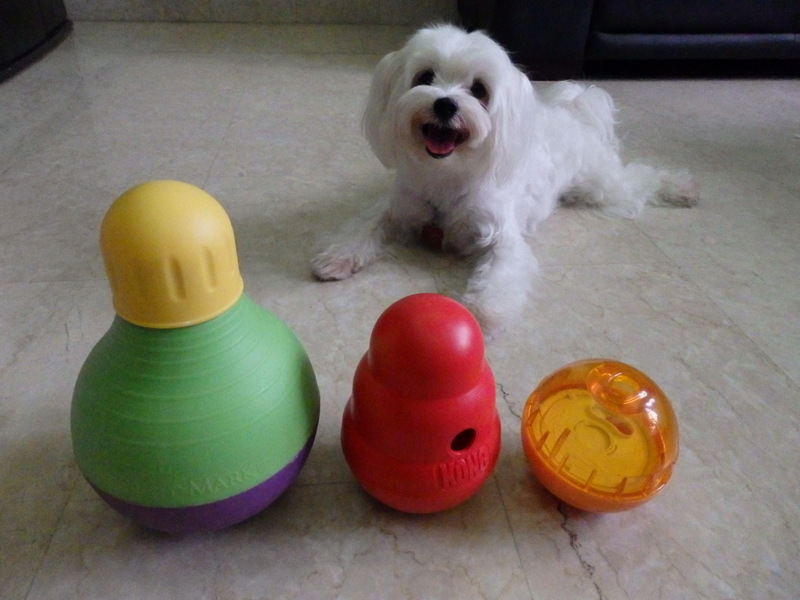 I’m always looking for sturdy interactive toys – how sturdy was the Kong? Choppy tends to “solve” all her interactive toys in the same way: by brute force/destruction of the toy. She has only destroyed a couple Kongs over the years, so that might be an option. It’s not made of rubber like the Kong Classic, but very heavy plastic polymer, hence I think it would be difficult to even chew for an aggressive chewer. However cotton doesn’t chew items so I wouldn’t know with 100% accuracy 🙂 From what I have read online, the most difficult to destroy would still be the IQ ball because it’s too awkward for dogs to get a grip on 🙂 Definitely not the Bob-A-Lot though. Awesome – thanks for the info! Great post. Very informative. Will definitely check some of these out. Thanks for visiting! 🙂 they are really fun! I miss Cotton and you so much omg ); Reading these posts fill me with such nostalgia and longing D,: Been showing these pics to my friend lol. I came to see what Cotton has been up to. Looks like Cotton has been very busy. Thank you for the post, very informative and entertaining. What size is cotton using for the iq ball?